"A rare piece of audio equipment, and a precious one, too." Sound "Its most compelling quality is the totality of its performance." "The TL-7.5 is a resolution champ," and its dynamic range "is immense." "High frequencies are flush with naturalness and sheen, and excel at the realistic portrayal of attack, overtone, and decay." "The TL-7.5 possesses no tubey lushness or solid-state coolness -- it has very little identity of its own." , and four single ended only. There are four sets of main outputs, two each single ended and balanced, along with two sets of single-ended tape outputs." Use Functionally, "the TL-7.5 gets 75% of the way to the Mark Levinson No.32, the apex of user friendliness in stereo preamps, and no other tubed preamp that I know of gets close to either unit." "There is a potential issue with your amplifier and the TL-7.5: hiss from the speakers due to high voltage gain." Value "A preamp that even at $13,500 justifies its price, and is even something of a bargain among top-of-the-line models." The gulf between statement-level preamps seems to grow wider with each new model. As solid-state preamps move toward greater user friendliness, as represented by the Mark Levinson No.32 Reference and Classé Audio Delta CP-500, their tubed brethren remain firmly rooted in the sonic-purity-above-all camp. A tube preamp might include remote control in the way of user niceties, but rarely more -- and often not even that. Vladimir Lamm is famous for saying that remote control is "bad for sound," and I can't argue with him given that his L2 Reference, which uses tubes, is one of the very best preamps I've heard. Audiophiles, however, like features -- stuff -- including remote controls. Having just reviewed the Levinson No.32, I can say that it's a mighty seductive piece of gear to use, aside from any music that it reproduces. In terms of features, there are a few bare-bones preamps on the market, like the Lamm L2 and CAT SL-1 Ultimate, and more that throw potential buyers a couple of ergonomic bones to entice them. All such preamps that come to mind are tubed. I've owned and admired CAT and Lamm preamps, choosing their sonics over ease of use. I'd still do so any day. 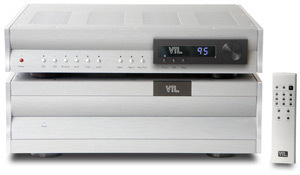 The subject of this review, the VTL TL-7.5, takes a unique approach for a modern tubed preamp. It has many of the user features of the Mark Levinson No.32, and its design is reportedly hot-rodded for sound quality, like that of the Lamm and CAT preamps. On paper it's an intriguing piece of audio equipment, and this holds true when it's in the equipment rack as well. VTL, short for Vacuum Tube Logic, was founded by father and son David and Luke Manley. The elder Manley was a recording and film engineer who designed tube amplifiers for studio and home use, and these products were the groundwork for the company. Today, VTL is fronted by Luke Manley alone, and the company's most recognizable products are still its tube amplifiers, some of which have two stories -- one chassis on top of another -- and output many hundreds of tetrode or triode watts. When you see and hear one of the big VTL amps, you know how unique they are. In 1998, VTL set out to create a Reference line of electronics -- products that were better than anything the company had produced to that point. In regard to the TL-7.5, Luke Manley set a lofty goal for his five-member design team: create a preamp that would outperform all others sonically and produce measurements that would back up its sonics. The TL-7.5 Reference preamp, along with the Siegfried and S-400 amplifiers, came out of this project. The new TL-6.5 preamplifier recently introduced at CES is the latest addition. These four products show some real forward thinking, including the use of unique power-supply schemes and circuit topologies. 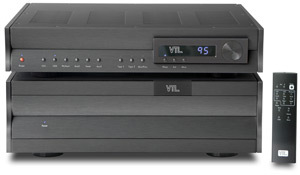 VTL began working on the design for the TL-7.5 in early 1998, and the preamp hit the market in 2002. The $13,500 USD TL-7.5 is a fully balanced, microprocessor-controlled, remote-controlled preamp that uses the same sort of two-box design as the Mark Levinson No.32: the audio functions of the preamp are isolated from everything else to ensure sonic purity. Accordingly, the large audio chassis (17 1/2"W x 17 1/2"D x 6"H) has no knobs, LEDs or displays, while the smaller control chassis (17 1/2"W x 17 1/2"D x 4"H) has all of these along with the power supply, microprocessors, and anything else that could affect the performance of the audio chassis. A pair of cables that I recognized right off as SCSI ("scuzzy") computer cables connect the two halves, sending commands from the control chassis to the audio chassis. The power cord connects to the former, and an umbilical brings only DC to the latter. No digital or logic functions (and therefore no noise) occur in the audio chassis. This is an incredibly smart layout, and I expect to see it replicated in many top preamps in the future. The TL-7.5 is a hybrid, mating a tube gain stage featuring a pair of 12AX7/ECC83 tubes to a MOSFET output stage. VTL settled on this in order to take advantage of the sonic qualities of tubes and the ability to drive any load, even through long cable runs, of MOSFETs. The TL-7.5's software-controlled potentiometer features a low-signal reed relay (a series of hermetically sealed reed, or flat-blade, switches) and has precision resistors for each volume point. It offers 95 individual steps of 0.7dB each, and VTL can adjust for larger or smaller steps. The volume control also handles balance and input-offset duties, the latter of which allows adjustment for the differing output levels of source components, thereby making sure the ultimate loudness of each is very nearly identical. By using a single potentiometer for all of these functions, the TL-7.5 avoids the sonic degradation, no matter how slight, of multiple pots. At every turn, the TL-7.5 seems built to preserve the purity of the musical signal and appeal to audiophile sensibilities. It uses multiple regulated power supplies for each amplification stage, and its chassis is made of non-magnetic aluminum. And get this: The circuit boards for the tubes are shock-mounted to lessen microphonics. Of course, the TL-7.5 is a dual-mono design, with the left and right channels isolated to prevent crosstalk. The two chassis weigh a hefty 75 pounds in total. The TL-7.5's eight inputs are broken down into two groups: four single ended or balanced -- you choose and configure the preamp accordingly -- and four single ended only. There are four sets of main outputs, two each single ended and balanced, along with two sets of single-ended tape outputs. The TL-7.5's display primarily indicates the volume level, but it is also used for adjusting channel balance and indicates that the preamp is in standby. The remote control has a nice all-aluminum case and fits nicely in your hand. Most of what you can accomplish from the TL-7.5's front-panel controls you can also do with the remote, and every important feature is duplicated, including phase and balance. After the TL-7.5's circuit design was finished, somebody spent considerable time putting the fine touches on the user interface. In terms of functionality, the TL-7.5 gets 75% of the way to the Mark Levinson No.32, the apex of user friendliness in stereo preamps. No other tubed preamp that I know of gets close to either unit. Someone also spent considerable time on the aesthetic design of the TL7.5. It is very handsome -- pictures don't do it justice, especially with its cool-blue display on. It is available in black or silver finish. I prefer black, the color of the review sample, but in silver the preamp looks as crisp and brilliant as a newly minted quarter. The TL-7.5 Reference was used with a number of products that aspire to the same sonic heights. Speakers were Wilson Audio MAXX 2s, which Luke Manley also uses. Digital source components were an Esoteric X-01 CD/SACD player, Zanden Audio Model 5000 Mk III and Model 5000 Signature DACs, Zanden Model 2000P and Mark Levinson No.37 CD transports, and an Audio Research CD3 Mk II used as both a standalone CD player and transport. Interconnect and speaker cables were from Cardas (Golden Reference), AudioQuest (Sky and Volcano), and Shunyata Research (Antares and Orion). Power cords were all from Shunyata Research -- Anaconda Vx and Alpha, older Python and Taipan -- as was the Hydra Model-8 power conditioner into which I plug everything. Electronics sat on a pair of Michael Green Designs racks, Harmonic Resolution System M3 platforms, and Silent Running Audio VR 3.0 isoBases. Amplifiers were Lamm ML2.1 and M1.2 Reference monoblocks as well as a Blue Circle BC202 stereo model. I mention these apart from the other ancillary equipment because there is a potential issue with your amplifier and the TL-7.5: hiss from the speakers due to high voltage gain. Voltage gain is the ratio of voltage at the output to voltage at the input, and it is expressed as a number that represents a multiplied value (20, as in 20 times) or in decibels. A certain voltage-gain figure isn't bad or good in itself, but high voltage gain from both a preamp and amplifier can create background hiss, especially if your speakers are sensitive. The TL-7.5's voltage gain is 26dB from its balanced outputs, 20dB from the single-ended jacks. Paired with both the Lamm ML2.1 and Blue Circle BC202, whose voltage-gain figures are 26dB and 21.5dB respectively, there were no problems. However, with the Lamm M1.2 Reference amps, whose voltage gain is a very high 32dB, preamp and amps produced hiss through the MAXX 2s that I could hear from the next room, let alone at the listening position. Moving to the single-ended outputs lessened this a bit, but the outcome still wasn't ideal. In such cases, VTL suggests swapping the TL-7.5's 12AX7 tubes for 12AU7s, which lowers the voltage gain by 10dB. I did this, and the TL-7.5 and M1.2 Reference amps worked fine together when connected via the preamp's single-ended outputs. The 12AU7s give the TL-7.5 a slightly softer sonic presentation, which may mate better with certain amps, although I can't say that I thought it was an improvement. The TL-7.5 sounds its best with the stock 12AX7s. It is important to keep in mind that this situation is the product of an equipment mismatch. It is not something you will experience unless you bring together the TL-7.5, an amp with high voltage gain like the M1.2 Reference, and perhaps sensitive speakers. Lamm's L2 Reference preamp, for example, has 15dB of gain, making it suitable for use with the M1.2 Reference monoblocks, and indeed any of Lamm's amplifiers. VTL's Siegfried and S-400 amps have 20dB of gain, and they work well with the TL-7.5. Just keep this issue in mind when you audition the TL-7.5 or M1.2 Reference, and especially if you hear them together. Terms like "reference" and "statement" are thrown around in audiophile circles with regularity, which dilutes their meaning. Thus, a product like the TL-7.5, which has Reference in its name, starts out at a perceptual deficit, having to make up for its grandiose moniker. It does -- functionally and especially sonically. The TL-7.5 is a reference preamp if I've ever heard one, but it is not an audio product that will have you blurting "Wow!" at the very first note. Its most compelling quality is the totality of its performance. It does not maximize one sonic trait, seemingly to the detriment of all others. If you value completeness of musical expression, the VTL TL-7.5 will elicit sustained delight with each cut you play. Resolution, the reproduction of all manner of musical detail, is something that any piece of equipment seeking reference status has to have in abundance. The TL-7.5 is a resolution champ, and not just in the big, blustery moments, but with fine detail and instrumental textures. One of my favorite JVC XRCDs is The Kenny Drew Trio [Victor VICJ-60213]. It was released a few years ago along with a half-dozen other XRCDs of terrific jazz-trio recordings, including Hampton Hawes' Vol. 1: The Trio [Victor VICJ-60215] and Ray Bryant Trio [Victor VICJ-60212]. More please! On "Caravan," piano, bass and drums inhabit distinct spots in the soundstage, and each has a certain inner energy that helps carve out a place among the other instruments. "Perfectly detailed" say my listening notes, in an attempt to convey that what I heard was not due to any added edge but rather the ability of the TL-7.5 to capture and convey even the smallest musical gestures, which were as distinct and finely rendered as the recording allowed. The TL-7.5 possesses no tubey lushness or solid-state coolness -- it has very little identity of its own. Its perspective -- the view of the music it gives -- is ideal to my ears, neither forward nor laid-back, and its sound possesses no exaggerated sense of speed or spaciousness. It is a component through which the music speaks clearly, with what is present on the recording and nothing more. There are two ways to describe such sound: The TL-7.5 does everything in remarkable fashion, or it does nothing that stands out. The more I listened, the harder it became to discern the TL-7.5's personality, and the easier it became to hear what each recording really sounded like. I pulled out some long-unplayed favorites -- recordings that I thought I knew well from having heard them often on other collections of equipment. On Neil Young's Harvest Moon [Reprise 9 45057-2], "Unknown Legend" (which my brother-in-law calls "The Harley-Davidson Song") and the title cut sound very different, as though they were recorded in different studios. I perused the liner notes thinking I had made this discovery -- no such luck. "Unknown Legend" sounded far more billowy and its soundstage more vast than I remembered, while "Harvest Moon" was more full and weighty. Both cuts sounded new to me. I recalled that "The Frozen Man" from James Taylor's New Moon Shine [Columbia CK 46038] always sounded big and forward, but not through the TL-7.5, which resolved layers of instrumentation and a sense of air that I didn't know existed. Hearing such recordings as they truly are is always fulfilling. The TL-7.5 can reproduce them in no other way. The idea of a characterless component can make audiophiles cringe. It often carries with it the idea of treble that is steely and lacks natural color. The graceful (as opposed to a nearly ballistic) reproduction of the leading edge of guitar and cymbal is thought to be missing as well. This is not the case with the TL-7.5, whose high frequencies are flush with naturalness and sheen, and excel at the realistic portrayal of attack, overtone, and decay. An all-encompassing example of this occurs at the end of "Evolve" from Ani DiFranco's CD of the same name [Righteous Babe RBR030-D]. The sound of the final guitar strum is a full ten seconds in duration -- the next song begins before the decay has run its course completely. The TL-7.5 communicates it all, and never makes anything that happens in the treble region sound out of proportion or spot-lit. The dynamic range of the TL-7.5 is immense, due in part to the preamp's overall resolution, and its bass definition and dexterity are impressive. You can hear subtleties that are buried deeply in the mix, but when the music lets loose, you will be bowled over by the power and scale. On "Parker's Mood" from the CD of the same name by the Hargrove/McBride/Scott trio [Verve 314 527 907-2], Roy Hargrove's trumpet cuts through the air in short blasts, the TL-7.5 climbing like a fighter jet. On "Steeple Chase," Hargrove's small variations are communicated with proper scale and importance, not as though they are obscured by the rest of the music. The TL-7.5 captures all of the nimbleness of "Red Cross," a two-minute bass solo that's not about weight and density, but rather speed and detail. However, when Christian McBride lets a few notes hang -- purr -- their presence is fully accounted for. Again, the TL-7.5 goes to no extremes; it depicts the music as it is, with a realistic dynamic gradation and bass power. In fact, the TL-7.5 respects the signal fed to it in a way that few pieces of equipment do, and it is always musically consonant. Its performance was rife with texture, color and nuance, and it never sounded clinical or bleached. When you mate this with the TL-7.5's innovative design and above-average feature set, you have a preamp that even at $13,500 justifies its price, and is even something of a bargain among top-of-the-line models. Call me out of touch with reality for stating such a thing, but also name me another preamp like the VTL TL-7.5. Last month I reviewed the Mark Levinson No.32 ($15,950), a preamp that has more in common with the TL-7.5 than any other I know of, including having Reference as part of its name. Both are fully balanced and remote controlled, both feature the same two-box, audio-chassis/control-chassis architecture, and both offer a profusion of inputs and outputs. They are über preamps, suitable for two-channel-only or combined stereo/home-theater use. The No.32 regenerates its own power, and the TL-7.5 uses vacuum tubes; both of these design features, I'm sure, contribute a great deal to each respective preamp's sonic performance. I described the No.32's sound as "silky, with such ease does it portray music, conveying all manner of relevant detail in an utterly agreeable, unrestrained manner." However, I also noted that "the No.32's easy-going nature may be an impediment for some listeners, as it kept the music somewhat at arm's length." What I discovered was that this character may be due to the Arlon 25N used for the No.32's circuit boards. After my review, my contact at Mark Levinson let me know that the company's other preamps, which don't use Arlon 25N, sound more incisive. Who would have guessed? The TL-7.5 is more incisive than the No.32, although its sound certainly wouldn't qualify as incisive by inclination. The TL-7.5 offers a more neutral view of the music, neither laid-back nor forward, biting nor syrupy. The TL-7.5 offers a more vivid and vibrant view of the music than the No.32. It has more texture, especially through the mids, which lack overt fullness but convey an abundance of lifelike shading. The No.32 sounds a touch synthetic in comparison, not as sparkling and energetic. The No.32 certainly has its sonic strong points, but in comparison to the TL-7.5, it requires a few things from the listener, and therefore creates a kind of dis-ease that the TL-7.5 does not. Features and system-matching concerns may push you toward the No.32, but if you purchase it without auditioning the TL-7.5, you are overlooking one of the best pieces of audio electronics on the market today, and potentially paying thousands more than you have to as well. Functionally and sonically, an active preamp can limit your system or elevate its performance. So often, functionality and sonics do not inhabit the same chassis, or do so in compromised fashion. Such is the way of audiophile life today, with the exception of the VTL TL-7.5 Reference. The TL-7.5 is an intelligently designed preamp that seems to never miss a trick -- it has a full set of features and superior sound. The TL-7.5 reproduces music in a fashion that doesn't overstate or gloss over any aspect, and using it is a pleasure. In fact, the most interesting thing I can say as I sum up the TL-7.5 is that even with all that I've written to this point, there is still plenty that you will be able to discover for yourself. The TL-7.5 is that rich an audio component. While high-performance stereo preamps seem to be moving either toward greater functionality or more exalted sonic performance, the VTL TL-7.5 Reference delivers both, and at a price that, while not in the budget category, is not at the ceiling for its competition. This makes TL-7.5 a rare piece of audio equipment, and a precious one, too.